This remarkable device was the first of a completely new breed of detection devices produced by the Oswald-Lehmann Factory, an R&D unit dedicated and highly expert in the field of odour detection, at the turn of the century. As can be seen from the photograph, the device was intended to be a highly-manoeuvrable, easily portable device manned by a single operator. The core of the NOSE was an artificial rhinarium grid of genetically modified canine olfactory cells, grafted to a small QUIDNAC which performed analysis, amplification and filtration before on-passing the to the operator’s own nose. NOSE operators, selected at birth for their sense of smell, were a breed apart. In order to preserve their senses, they were kept in a tightly-controlled environment in odour-free dormitories at the Nasal/Olfactory Sensing Telemetry Research Intelligence Labs (or NOSTRIL as it became known). It was a lonely, hermetic existence, and took its toll on many of the inmates. Eccentric at best, psychopathic at worst, they were tolerated purely for their amazing abilities to “read” odours in the air passing towards them. Unflatteringly referred to as the Bogey-Men or Booger-Men (for the fact they were hand-picked from NOSTRIL) each operator was a walking personality disorder, and required a comprehensive support team of psychiatrists and nurses in order to function effectively. To some extent, the Smellescope was originally an invention needing a niche. 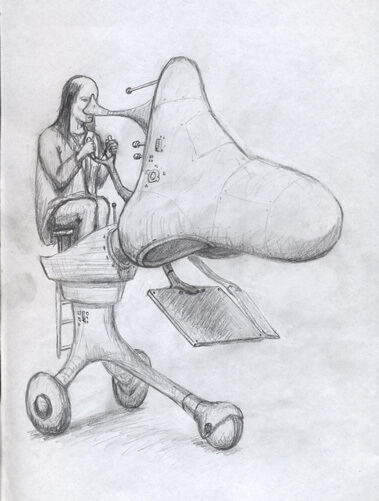 The technology was developed as a by-product of intensive research into Auditory Enhancement (see related post at bottom) and lay un-utilised for several years before it was realised that it would significantly enhance detection of approaching enemy units of literally any type: traditionally fuelled, animal powered, even clockwork mechanicals were revealed by their signature odours on incoming airstreams. But as it turned out, the NOSE was much, much more than merely another medium range detection device. Truly adept operators were able to detect such subtle changes in human body chemistry that a number of fields were enhanced, if not revolutionised. The classic example that everyone now knows is the medical variant of the system, used to detect nascent cancer cells. Less-publicised but equally powerful in its way is the lie-detection apparatus built around a NOSE unit – able to detect with uncanny accuracy changes in the interviewee’s body chemistry as an indication of stress-levels related to lying. Eventually the units appeared for rental on the open market, with a built-in credit card reader. Hence you had to pay through the nose to use one.